Buttercup, and my first Gen X swap block came in handy. Hello, cute elephants! I'm experimenting with other layouts rather than the rainbow-esque color flow, so I think this will work just fine! Warm and cool layout. I didn't stick to the same solids as Rachel, but here's an attempt to mirror the color flow in the traditional bottled rainbows quilt. The major difference here is that I put 4 of my favorite blocks in the middle, which are all bold colors, and built out from there. Disco-esque layout. Since spreading out the oranges is a must, I think I'm partial to this layout. 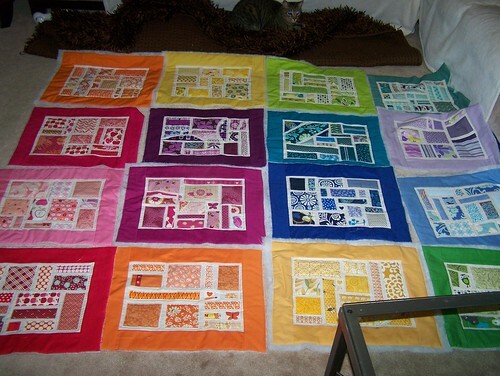 In fact, it reminds me a lot of Jess's Scrappy Rainbow Quilt, which I loved. And I kept some of my favorites in the middle, for optimal viewing. I may or may not sew them together today. Need to get moving on some freelance work, and I wouldn't mind another day to mull over the possibilities. Did you finish any projects this weekend (or come close)? So right now they are all like separate little quilts.. 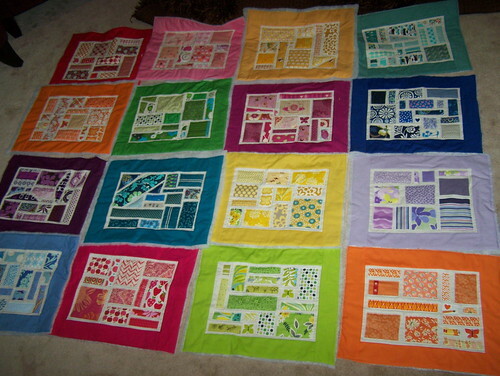 I would LOVE to see HOW you sew the m all together and make them into one quilt.. it would be a great learning experience for me. These look fantastic! Your super close to finishing this. Yay! Wow what an amazing quilt, I just love the use of all the colors. They look awesome!! I love that Cercise one too!! I really like that disco-esque layout!! Awesome! Man, I love this quilt. I'm really digging the first layout. That turquoise block with the big diagonal piece really catches the eye! I'm sure however you end up sewing them together it'll look great. Good job! I love the rainbow blocks along. 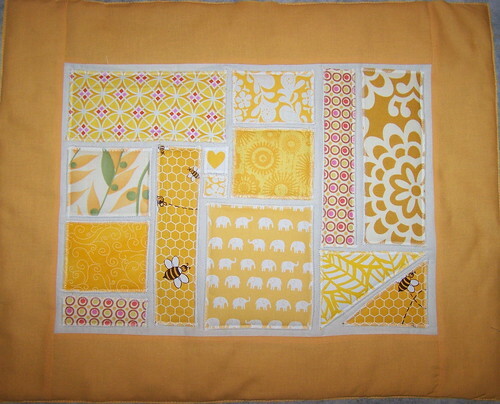 Dunno if I would have had the patience to do it, though :) I really like the buttercup block! wow....your doing a fantastic job!! I like, I like! 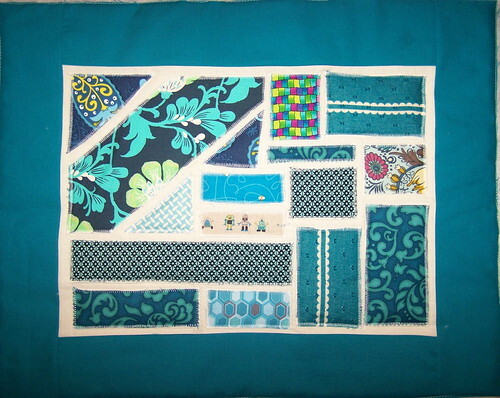 Your blocks are so neat and well sewn too! I've noticed a couple of those ticker tape types that got a little bunchy. Yours look great! 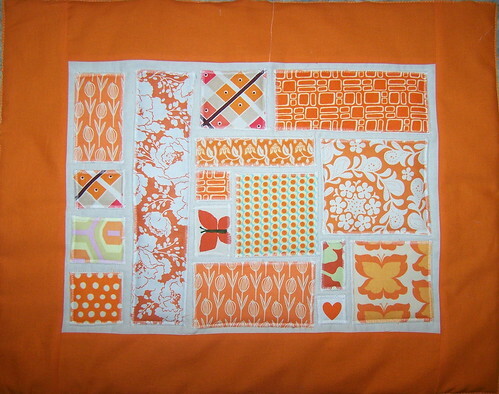 I like your colors and the placement of fabrics on each block. I have seen people use a variety of ways to fill that space. It's part of being individual but that said, I like yours. 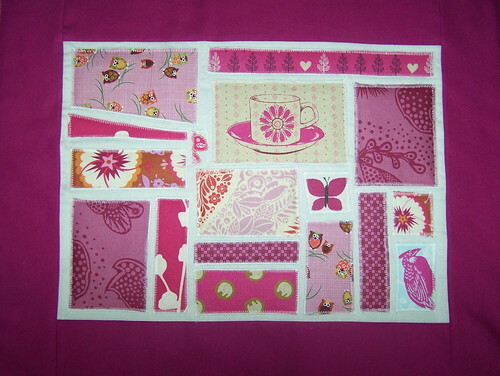 oooo I really like the first quilt layout. it has a great, cohesive feel to it. and really accentuates the rainbow! Congrats on finishing your blocks!I love your first idea for setting the blocks together. I just finished getting mine basted and ready for quilting. Not sure yet how I am going to quilt it. Such a fun project.